Unmindful of "pressure" and other external forces, ACID WITCH stayed busy enough in the interim, teasing out a split 7" with the legendary NUNSLAUGHTER and a special covers EP where they gave their own, inimitable renditions of hair metal classics from '80s horror movies. That latter element, in an evilly crowd-pleasing way, can be immediately felt on "Evil Sound Screamers" - or, perhaps, ACID WITCH had always had their own starpower all along. Either way, one listen through "Evil Sound Screamers" and it's awesomely apparent that the band have raised the stakes yet again. Essentially, this is the sound of ACID WITCH mastering their own, unique brand of metal and delivering a landmark record for the ages. The foremost manifestation of that mastery is the truly mindfucking layering of synth here. Slasher Dave has always possessed an authentically classic-horror approach to synths, but through his own selfsame solo-project, he's developed that aspect in a manner truly befitting the beloved horror canon of the '70s and '80s. Here on "Evil Sound Screamers," those synths don't so much take a lead role as unite every thread across the record, flitting in and out of perception like a fever dream (or an LSD nightmare) and otherwise torquing all the gutsfucking riffs that now stomp 'n' sway with a rousingly anthemic quality. They are authentically analog synthesizers, too, just like the beloved sound design of those classic horror movies. Additionally, the acute placement of samples further threads everything together in a manner most filmic. And that's to say nothing of the production here, which finds a hazy, crazy balance between murky and 3D. Before you know it, the 38 minutes of "Evil Sound Screamers" is up and you're immediately pressing "play" again and again. 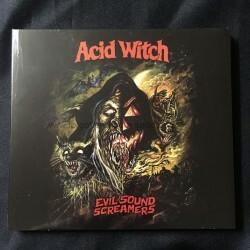 Now more than ever, there's really no other band out there quite like ACID WITCH: "Evil Sound Screamers" is their magnum opus, and long may their reign continue. This is the season of the WITCH!